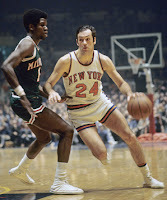 Bill Bradley is no stranger to success. In fact, he’s fluent in it. From the age of 20, the man’s built a resume that’s frankly difficult to fathom. 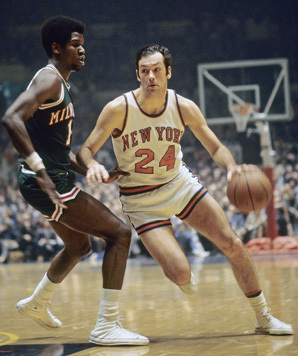 In short, Bill Bradley is the most accomplished man ever to take the floor in the NBA. While playing at Princeton, he averaged 29.8 ppg, earned First Team All-America honors twice (1963-64 and 1964-65), was named AP’s Player of the Year and the Final Four’s Most Outstanding Player in 1964-65. In 1965, he won the James E. Sullivan Award, presented annually to the United States' top amateur athlete. In the meantime, he was a unanimous selection to the 1964 Olympic basketball team, with whom he captured a gold medal in Tokyo. He also graduated with honors, was awarded a Rhodes Scholarship at the University of Oxford, and had a book written about his time in college (John McPhee’s "A Sense of Where You Are"). While attending Oxford, where he studied political and economic history, he played professionally for a year (1965-66) for Olimpia Milano in Italy's top league, with whom he won a European Champions Cup. Once in the NBA, he produced 10 quality seasons, earned a trip to the All-Star Game in 1973 and was a key member of championship teams in 1970 and 1973. His solid play, along with a rare commitment to sacrifice in the name of a collective goal, earned Bradley induction into the Basketball’s Hall of Fame in 1982. In 1976, toward the end of his NBA career, he authored “Life on the Run,” a book that uses a 20-day stretch of time on the road during the season along with takeouts from Bradley’s career to try to explain the NBA and early 1970s America. (Note: “Life on the Run” is an exceptional book. I have no vested interest in promoting it. It’s just a fantastic read). He retired from professional basketball in 1977, with the opportunity to enjoy the luxurious trappings of a triumphant decade. Instead, the summer after his retirement was spent campaigning for a seat in the United States Senate, representing New Jersey. Naturally, he won. He would hold this seat for three terms, until 1995, when he elected not to run for re-election. While in the Senate, Bradley fought for, among other things, reform of child support enforcement, legislation on lead-related children's health problems, campaign finance reform and the Freedom Support Act, and an exchange program between the republics of the former Soviet Union and the United States. After leaving the Senate, Bradley ran in the Democratic primary for the 2000 presidential election, opposing incumbent Vice President Al Gore for the nomination. While this bid would prove to be the only conspicuous shortfall on an otherwise sparkling record, Bill Bradley has continued to add to his Hall of Fame resume. Since ending his candidacy for President in March 2000, Bradley has pursued numerous opportunities in the private sector and supported a number of worthy causes in the non-profit sector. One organization with which Senator Bradley has aligned himself is Beyond Sport, an international organization that looks to affect social change and enhance cultural understanding through the use of sports. On September 29 & 30 in Chicago, Beyond Sport hosted the Beyond Sport Summit, which celebrates and promotes the use of sports social change by uniting influencers from the worlds of business, government, and sporting federations. EA: You are an ambassador for Beyond Sport, an international organization that uses sports as a vehicle for social change. You’re currently in Chicago for the Beyond Sport Summit, which is taking place today and tomorrow, and is aimed at promoting further advancement in sport-led social change. I’m somewhat familiar with Beyond Sport, but would love to hear more about the organization and this week’s event. BB: What Beyond Sport does is recognize individuals that use sport to facilitate social change. Ice hockey and street hockey in the streets of large cities, for example. Or playground soccer in a wide variety of nations around the world. You can see Sunni and Shiite kids, or English and Irish kids, Israeli and Palestinian kids using sport to break down barriers and to embrace a certain universality of values that it embodies. EA: As an NBA player, Senator, and Presidential candidate, you’ve taken strong stances and led the charge for social change. What was it about Beyond Sport that spoke so strongly to you and drove your involvement? BB: As one of our speakers at the Summit said today, you can be anywhere in the world and there’ll be a sport. It’s often soccer, but it’s often basketball and you can see the same human values at play—discipline, selflessness, courage, imagination—and you see these things in sport and you can imagine how the world would be better if it truly reflected some the best values that you can learn and that sport exemplifies. EA: I couldn’t agree with you more. Now, shifting gears a little bit, I think this speaks a little bit to what you were just talking about. In 1976, you wrote a book entitled “Life on the Run,” which focused on a 20-day stretch of a season. In the book you talk about relationships as well as the NBA experience. Describe the experience of writing that book and what you took from that. BB: I felt that I would be able to put something down that would accurately portray what is was like to be a professional basketball player on the road in America during the late 1960s and 1970s, and what that experience is like. The spine of the book is the 20 days on the road, and the takeouts are representative of aspects of that life. This includes the glory of the game, playing the game, the transcendent joy of making the right play, the celebrity that surrounds the game and often clouds things, the terror that awaits at the end of an athlete’s career, the selflessness involved in a team, the coach relationship, or the biographies that intertwine. What’s interesting about that book was that I wrote it in 1976 and the rights came back to me in 1996. I hadn’t read it in about 15 years. So I reread it and each of the characters were just as live. The book is about basketball, but it’s also about America during those times. EA: Building on something you just referenced with regard to “Life on the Run,” one of the book’s main themes is the beauty of selflessness and team play. You talk about it in reference to Bill Russell as well as in reference to your own Knicks teams. Talk about the dynamic of those great Knicks teams and the relationship you all had with one another. EA: Speaking of those teams, I’d like to ask you about one of your old teammates, coaching great Phil Jackson. I guess this question has two parts. That Phil was a bit of an eccentric guy in playing days has been well chronicled. In your opinion, what is it in his personality that has enabled him to achieve such great success as a coach? Also, was it evident back then that he’d go on to a successful coaching career? BB: I think you could see it when he was a player. If you think about it in retrospect, he had all the qualities that he demonstrates today as the most successful coach in NBA history, He was analytical about the game, he really was a student of the game, thought about it, strategized. He himself was selfless. He constantly gave himself for the team. Whatever the team needed, he did. Finally, he was able to relate to teammates as individuals, and understood how people are all different and how to relate to people differently. I think all of those qualities you see in his coaching style. He’s clearly got plans, strategy, he’s got the Triangle offense, he knows what he wants his players to do. He’s very analytical. He demands selflessness from his players. I actually think the reason they have won the recent championships in L.A. is because Kobe ultimately trusted his teammates, and that’s one of Phil’s great achievements. And finally, he relates to the players as individuals, he gives different things to each player to read that he thinks will mean something to them. EA: With regards to the most recent NBA offseason, what are your thoughts on the moves made by your old team, the New York Knicks? BB: I think the Knicks made a great move by getting [Amar'e] Stoudemire, and I think he’s going to be a part of a very strong core, and hopefully they are able to continue to fill it in around the edges. EA: In closing, any thoughts on the “Superfriends” in Miami? BB: I know there’s going to be a lot of people that are going to want to beat them. EA: My sincere thanks for your time, Senator. It's been an honor.